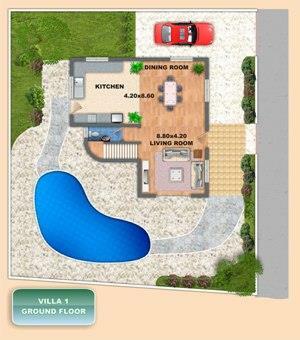 New and Off-Plan Properties for Sale in Paphos, Cyprus. "Tennis Court Estate w/ Smart Technology"
"3 Minutes from New Marina"
We work with a small number of Paphos builders who have helped us in planning and building our clients properties. These builders that we have carefully chosen meet high standards in building and work with exceptional teams of designers, architects, builders and laborers. The building and developing companies that we have chosen have worked for decades in the Paphos building industry, providing excellent service and use the most modern technology available. We have a selection of well designed projects in some of the best locations around Paphos, Cyprus. We have a selection of new villas, maisonettes and houses or we can help you design and build the property of your dreams with your exact specifications. We make the buying new property effortless by representig you every step of the way in Cyprus. We want to do everything possible in order to ensure your satisfaction and give you, the new property owner, the home of your dreams in Cyprus. Tell us if you are interested in a home with sea views in Polis, a traditional Cypriot style stone home, a new home or off plan property and we can help you find exactly what you are looking for. If you are a builder and believe that your standards in building, quality, overall customer service and history is outstanding and would like us to consider listing your properties then please contact us. Send us your properties and specification sheet with plans for consideration.